The first to grow hops and brew beer in the fledgling colony, James Squire’s place in Australian history is secure. A crafty blend of charm and assiduity, he grew from a convict shipped out on the First Fleet to Australia in disgrace, to a publican and philanthropist of great renown. 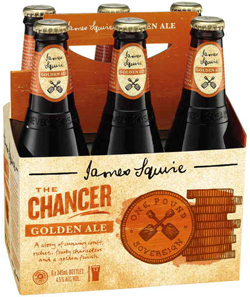 The James Squire range is named for him. Golden Ale’s toasted barley and wheat grains make it a bold, golden amber colour. It has a floral aroma thanks to the Amarillo hops used, and this also gives it slight bitterness. Fruity, citrus notes give way to a dry, thirst-quenching finish. Stunning flavour, refreshing and has a nice punchy depth. Delightful on the palate.